I got “caught up” just in time for the next step. Here is block 15. I am trying to bring in some more yellow and black into the blocks. 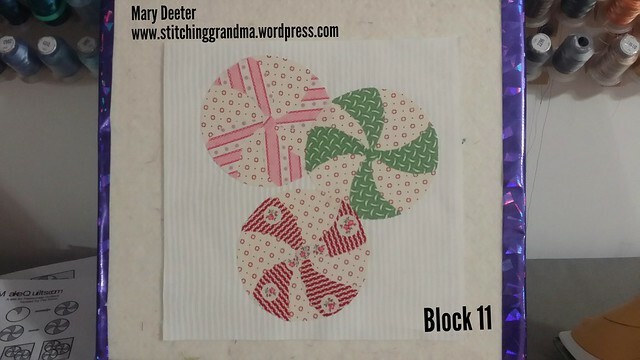 and here is block 16 — I wanted to carry through some more pink and green in this block. 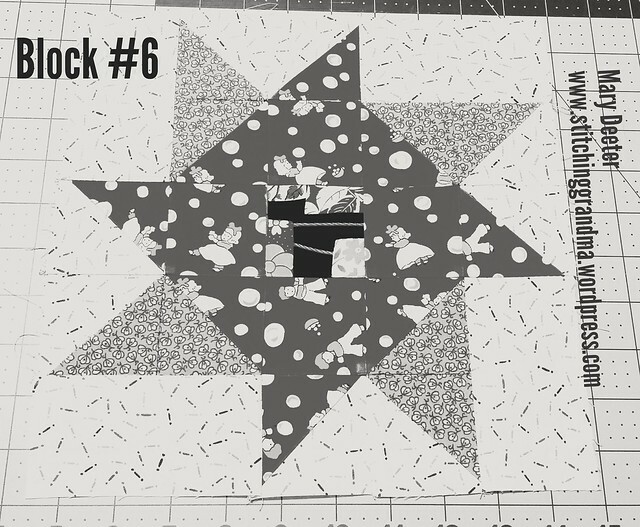 Today Pat released the layout for Grandma’s kitchen and the first 16 blocks can be assembled into rows. There are lots of “filler blocks” and sashing bits, so I will have to really look at the layout. I may “wait” and assemble the rows after the last 9 blocks are made. I have such a variety of colors that the balance is going to be very important to me for the overall look. Here are MY sixteen blocks arranged yesterday, before the layout was published. I keep “moving them around and every time I do, I end up with 2 blues side by side (or 4 in this case) or 2 yellows side by side, or 2 blacks side by side etc. I may not “like” my color choices in the position that Pat gives, so there may be some “re-arranging” of those 12 1/2″ and 10 1/2″ blocks. I have all my 10.5 in a row for no particular reason. I know that the fabric choices for the future blocks will be guided by the layout Pat has given. I have 1 other black fabric that I am “saving” – that great clothesline fabric I mentioned a while back. I may use it in sashing, but will have to do some adapting to use it to it’s best effect, as the print is large. Most of the sashings are 2.5 or 1.5 or 2×2. It is going to be interesting. It is 99% assembled, the borders are made and hanging there for MONTHS, just waiting to be sewn on! That will have to happen when I get back BEFORE I can lay out Grandma’s Kitchen! What’s on your design wall today? 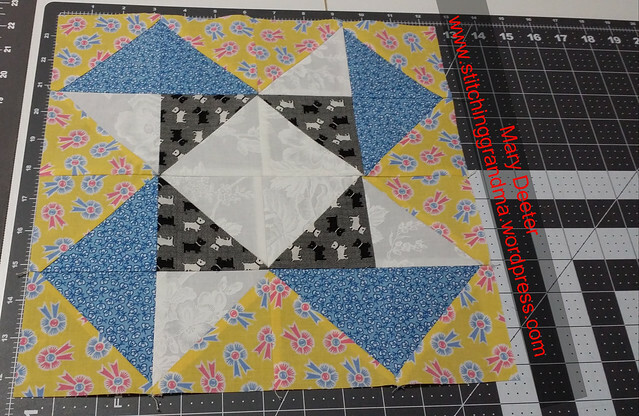 Off to Material Girls Quilt Bee today….I am ‘late’, but going. I’ll be working on my Autumn Jubilee (2016) placemats. Carole From My Carolina Home had a great pumpkin and leaf pattern last year and I have made placemat tops. Two are assembled and quilted, two are waiting for quilting, but today, I am going to build some more ‘leaves’ for 4 more placemats. My peppermint swirl pieces still need the applique top stitching done. They are “just fused” to the background piece. When I get my Janome back, then I can do that stitching. I think I will color match the threads when I do the top stitching. 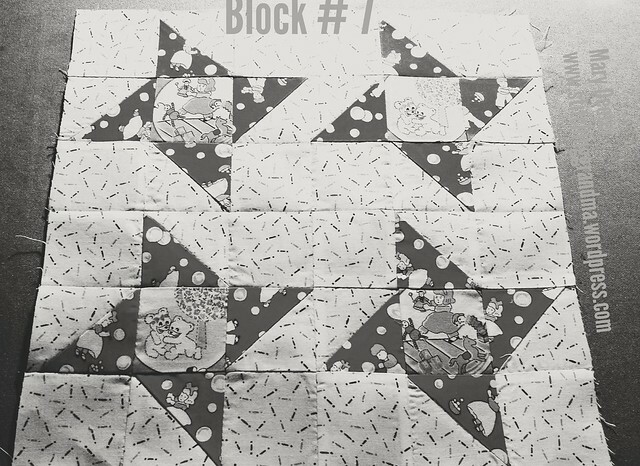 With each block, Pat tells stories of her memories of both of her grandmothers. They are sweet stories, and really make me ponder on my own grandmothers. Pat’s grandma always had peppermints. My Grandma Bessie always had lifesavers in her pocketbook. I decided to go with the “peppermint swirl” after I thought about the block for a while. Grandma Bessie always made ice cream with the leftover peppermint candy canes. Grandma Bessie was the one that I knew the best. She lived about 150 miles away, and we saw her frequently. I know that when I was really little she lived much closer and my older siblings say she really took care of all of us. My mother was recovering from cancer following the birth of my youngest sister, and I was just too little to know much of what was going on. I was only 1 1/2 when my sister was born, and I presume my grandmother kept the ship afloat while mother had surgeries and radiation. I have scant memories of toddler times. I am told that my mother and grandmother took the 5 children on a trip to Wyoming, and along the way I contracted scarlet fever. I must have been about 3 years old at that time. When we got home, all the children went to stay with my grandmother, while my mother cared for me in our home that had been quarantined by the health department. I know that my grandmother made silk nightgowns for me, from my father’s WWII parachute. I also know that the garments, linens and so forth all went into the incinerator in the back yard. I remember lying on the sofa in the living room, under the big picture window in those silky nightgowns. Grandma would dye them yellow, because it was my favorite color. My best memories begin when I was probably elementary school age, and got to spend more one on one time with her. By then, she lived in the Mojave desert, care taker of a ranch. It was a place where the “wealthy” people came on the weekends. I don’t really know what work she did; but I do remember hiking in the hills, picking up arrowheads, and learning about rattle snakes and the like. 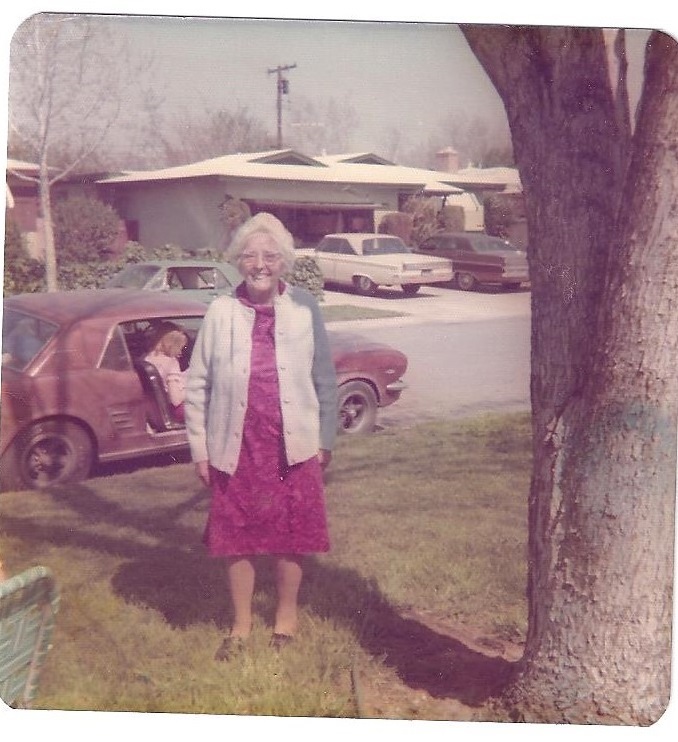 Grandma always carried a shovel with a sharp edge in the trunk of the car. She was a feisty woman, and there was not much she would not try to do on her own. She was a “rock hound” and a collector of those pretty bottles that changed colors in the hot sun. Her window sills were lined with the bottles she had gathered around the desert. This photo was taken of her in 1973 or 1974. I remember she was excited to see my “new” car. I was 17 or 18, and she was approaching 80. 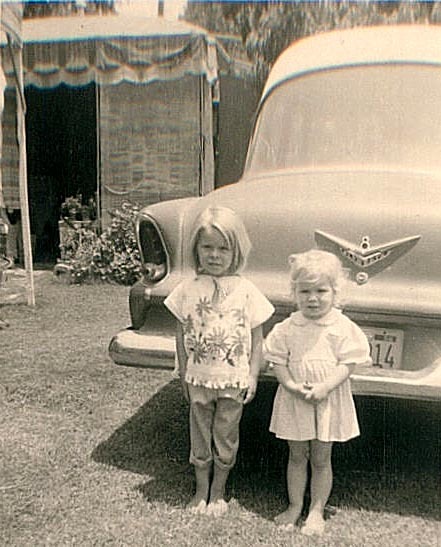 And this photo was from the late 50’s, near her “new car”. It’s funny, I think she had that same car until she quit driving! I look so tall next to my baby sister! We had some lovely adventures in that old car, driving trips out in the desert to lava fields and dry lake beds, and to the base of Mount Whitney, and out to old abandoned gold mining towns. Why, as school age youngsters, we even went to the Senior Citizens center with her, and learned to play cards. She really made each of the 5 children feel special in their own right. She was the typical grandma in an apron, cooking something wonderful for dinner, dishing up scoops of ice cream and tucking you in at night! This is a fun project and brings up lots of lovely memories. What’s happening in your sewing room this week? 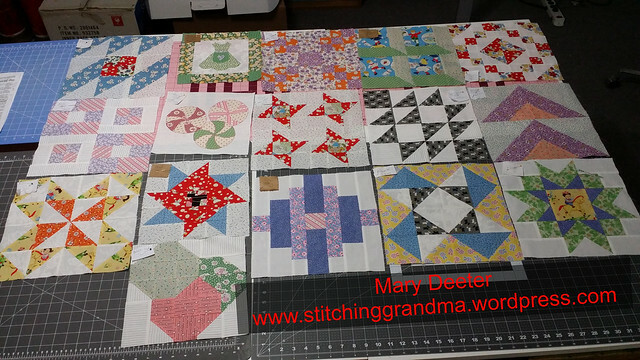 Last week was a very quilty kind of week! Monday was the monthly Ocean Waves Quilt Guild meeting. Instead of a speaker & trunk show, we had a full morning of sewing for our various Community Service Projects. Community Service Sew In is something we do every year. Some years every Community Service Group we sponsor is represented, and other years the chairman of the Community Service Committee picks 3 or 4 groups that could use a massive boost! This year we focused on just 3 groups. Don’t worry, we are still supporting the other groups all year long!! This was a great day to pick a project and sit and sew. 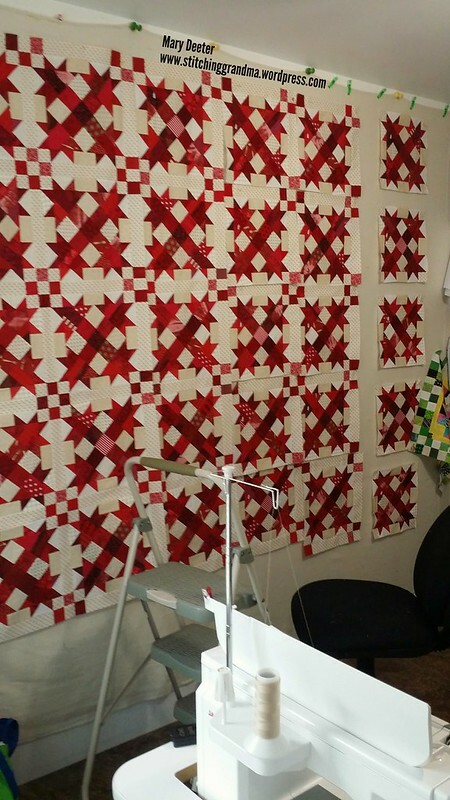 First I worked on blocks for Quilts of Valor (QOV). 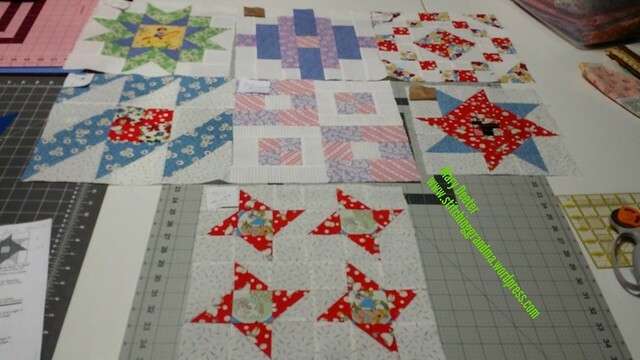 When QOV ran out of kits, I picked up a kit from the Quilts of Love table and set to work on it. Silly me, I forgot to take any photo’s of the QOV blocks. Before you knew it, time was up, and I hadn’t finished my little baby quilt. (I must have been chattering too much!) I took the kit home and finished it up last week. I love the organization involved with preparing all the kits for the guild members to work on. This was a cute and fun project to work on! 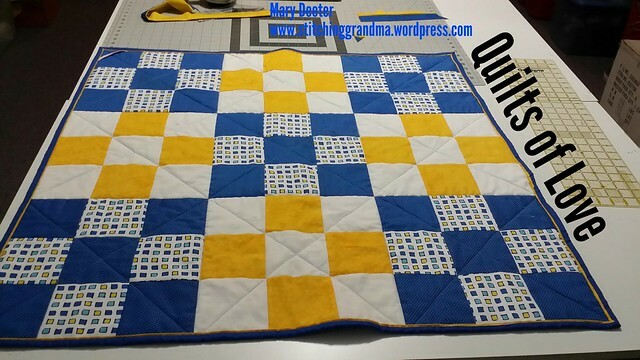 I chose to do a simple straight line quilting across the quilt instead of tying the quilt with floss. I also chose to make my own binding, using Susie’s Magic Binding method. I pulled some bright gold yardage out of my stash, but had plenty of the blue backing to get the needed strips for the binding. The backs were oversized for a “no binding” style quilt, but I much prefer making my own. While I was working at home, on this little quilt, my Janome 8900 started skipping stitches. I did everything I could to fix the problem, and finally gave up and switched to my “little” Brother CS6000i, to finish the binding. I took the Janome into the shop on Saturday morning for servicing, when my efforts were unsuccessful. I had “re-threaded”; “cleaned the bobbin case”; “installed a new needle” ; “wound new bobbins,” “re-threaded again” etc. The top thread was getting hung up in the race, and I could see where it was catching, but couldn’t figure out why. No amount of head banging was going to fix the poor ol’ girl. While at the shop, I took a photo of the inside of the bobbin case on the floor model. The first picture is the shop’s floor model (which needs some cleaning I think!). See that area I circled in red. Well look at the little red arrow, and then to the left of it. That’s what it SHOULD look like. 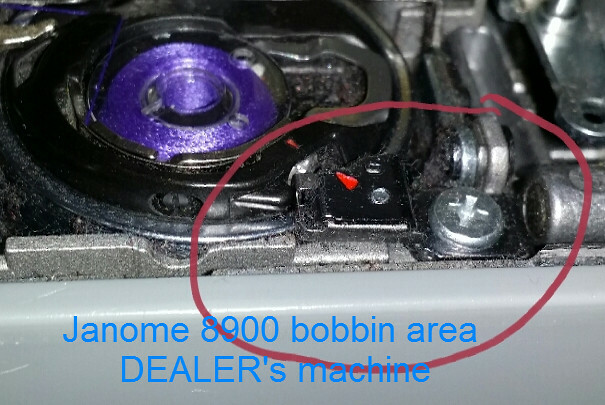 The picture below is MY machine, and now look at that strange thing next to the red arrow! That little hook near the arrow I drew was catching everything. How in the world did it get up above the bobbin case ??? Definitely what my thread was hanging up on! Because I couldn’t find any “close up photo’s” of how it “SHOULD BE”, I couldn’t explain to the hubby what was wrong. He would have dissected the machine and attempted a repair. Now, here is a question for you………….How often do you clean your bobbin area? Do you always take out the bobbin case and clean underneath? Do you use a brush or canned air or a mini-vac? 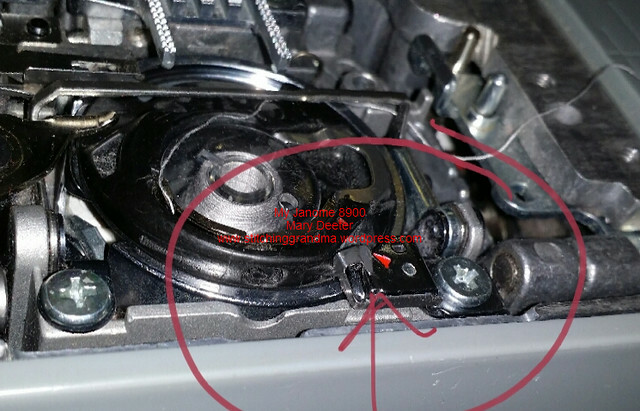 I’ve had one friend tell me the repair shop told her canned air is ok to use, yet on many websites, I read NOT to use it, as it could add moisture around electronics and / you can blow lint back into place you just can’t reach to extract it with a brush or tweezer or vacuum. So, what’s the real answer??? Meanwhile, the machine is down and out for the count for at least a week or maybe two. 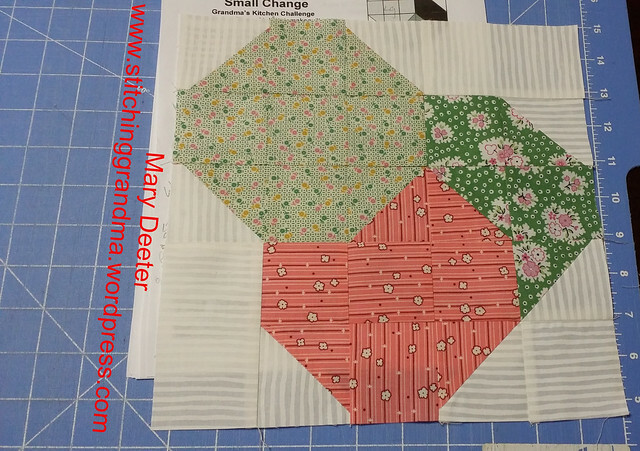 I had my 2 blocks to catch up on from Pat Sloan’s pattern – Grandma’s Kitchen. Once I got over my machine repair angst and got the blocks cut out, I got busy sewing them. For some reason, I did block 7 first. I fussy cut the centers of the stars. I’ve seen lots of these blocks done on-line this week, and lots of variations with color placement. I stuck with just the light background, medium centers and dark star points, and tried to keep the block consistent. Several posts I saw on Facebook showed different colors being used for each star, and some for each star point. I tried to keep it simple. Pat Sloan called this her “Oh My Stars” block. Famous words from a grandmother. I had a great “fat 8th” of laundry on the clothesline fabric in the 1930’s reproductions. Well, let’s say this – I have now got a container of “WHOOPS” blocks. 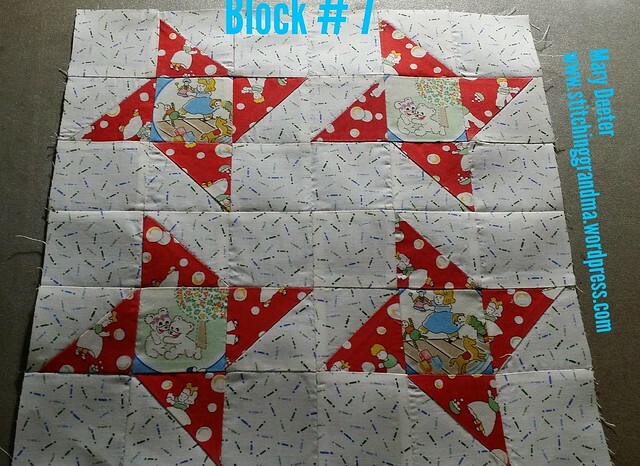 I ended up going back to the red from block #7 for my dark, and was only able to use one square of my clothesline fabric as the center square. (INSERT SAD FACE HERE). I decided when all was said and done, you would not be able to tell what the fabric was representing, as the piecework is so small ! And, I used up what I had, so (INSERT SAD FACE HERE). I was “hoarding’ that fat 8th since I bought it 3 years ago…………it was something I had not seen before, or since. Anyway, back to the red for the inner star, those circles look like soap bubbles, right?? I had to recut to make those red and blue HST’s, and the red and white HST’s after I discovered I screwed up! At that point, I decided to lay out the block and call it a night! I was a little apprehensive using the blue for the medium, but in the B&W photo below it really works. So, I am caught up with the Pat Sloan – Grandma’s Kitchen for now, even using the back up machine. Thinking ahead to getting some more of that great yellow and green into one of the next few blocks! Oh, and those black and whites I have pulled out with scottie dogs…. 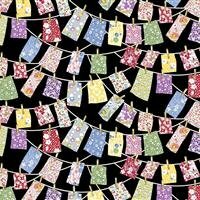 I went on an internet search today for the little bit of clothesline fabric! First I searched at a place Bonnie Hunter had recently visited on a trip to Minnesota – Reproduction Fabrics – Northfield MN, but no luck. So, I dug in the “dog bed stuffing pile” and pulled out the selvedges. I tried a new search tactic. I found it….and bought all I could get….not quite a full yard (like 31″) for $8.25. I am thrilled. What I love about this piece is it is all 1930’s reproduction fabrics hanging on the clothes line. So, THANKS to Two Bees Fabric of Texas for having the Sara Morgan Circa 1930 for Blue Hill Fabrics . So now, I have this “snippet (30+ inches) of fabric” coming by mail and I will hoard it again until the “right block” presents itself. I do hope Pat Sloan will give us a couple of blocks that will show off the larger prints in this pattern. If not, well, back to the 30’s bin it will go for future use. There you have it, the drama of the (insert sad face) sick sewing machine, and the multiple attempts at building block 6, along with the JOY of knowing I could get another bit of the clothesline fabric. While I was at the Delaware Sewing Center store with my machine, I grew slightly overjoyed that I purchased my Janome 8900 when I did, as the price has gone up by $1000 since I purchased it in 2013. (How does that happen??) The sweet lady in the store did her best to sell me on one of the machines that had a feature “she” loved….but the throat of the machine was too small for me. I just hope the cost to fix the machine is not too high. Keep your fingers crossed. Meanwhile, I will slog away on the ol’ Brother CS6000i. If it irritates me, I will bring my traveling Singer Featherweight up stairs to sew on. Time to sort some scraps! Happy stitching.